DON’T DRINK AND DRIVE Drunk driving is a major contributory factor to road crashes and road deaths in South Africa. If you going to a Christmas party and plan to indulge in a drink or two and get merry, don’t drive. Stay the night or plan a safe alternative to get homes such as a cab or designated driver. SLOW DOWN In the rush to get to a Christmas party or do your Christmas shopping before the malls close, you may be tempted to speed. But police presence is greater on the roads both day and night throughout the season, and a speeding ticket and possible accidents are not likely on your holiday wish list. WEAR YOUR SEAT BELT Always buckle up. Wearing your seat belt can reduce your risk of dying in a crash by about half. Also, make sure young passengers are buckled into appropriate safety seats. WATCH FOR EMERGENCY VEHICLES. In an emergency, every second count. When you hear a siren, be sure to pull off to the side of the road to allow the ambulance, police car or fire truck to pass. CARRY AN EMERGENCY KIT Always be prepared. The kit should include items that would come in handy if you are stranded on the side of the road or involved in a vehicle accident. PULL OFF THE ROAD IF YOU FEEL TIRED Please don’t try to drive when your eyes are shutting; you could kill yourself or others if you fall asleep. Have turns driving if there is another licensed person in the vehicle. Stop regularly to take breaks. PEDESTRIAN SAFETY TIPS BE VISIBLE Make sure you’re visible to drivers at all times and make eye contact with them whenever possible. This is especially important at night, in low-light conditions such as dusk or dawn or in inclement weather. Wear lightly colored or reflective clothing at night and brightly colored clothing during the day. Stay in well-lit areas, especially when crossing the street. If possible, make eye contact with drivers in stopped vehicles to ensure they see you before you cross in front of them. STAY ALERT – AVOID DISTRACTIONS Distractions are everywhere today and becoming more and more difficult to avoid. Remember that, as a pedestrian, your eyes and ears are your best tools for keeping safe. Stay alert and watch out. •	Put down your phone. Smartphones and handheld electronic devices are a daily part of life, but they take your eyes off of the road and distract your attention. Don’t wear headphones. Your ears will tell you a lot about what is happening around you – be sure to use them. FOLLOW THE RULES Know and follow all traffic rules, signs and signals. You need to be aware of the rules, vehicles around you must follow to properly anticipate what drivers will do. This will help increase your safety. •	Never assume a driver will give you the right of way. Make every effort to make eye contact with the driver of a stopped or approaching vehicle before entering the roadway. WALK IN SAFE PLACES Use crosswalks when crossing the street. If a crosswalk is unavailable, be sure to find the most well-lit spot on the road to cross and wait for a long enough gap in traffic to make it safely across the street. •	Stay on sidewalks whenever possible. If a sidewalk is not available, be sure to walk on the far side of the road facing traffic. This will help increase your visibility to drivers. •	Avoid walking along highways or other roadways where pedestrians are prohibited. AVOID ALCOHOL CONSUMPTION Almost half of all traffic crashes resulting in pedestrian casualties involve alcohol consumption. Alcohol impairs your decision-making skills, physical reflexes and other abilities just as much on your feet as it does behind the wheel. All Municipal Offices, except for emergency, essential services and stand-by personnel closes for the period over Christmas and New Year as from Friday, 21 December 2018 at 12:00 until Tuesday, 1 January 2019. All Municipal Offices will resume normal duties on Wednesday, 2 January 2019 at 07:30. Elijah Barayi Commemoration Merafong City Local Municipality together with the Gauteng Department of Sport, Arts, Culture and Recreation (SACR) hosted a commemoration of the late trade unionist and liberation struggle hero Elijah Barayi, one of the greatest revolutionaries and worker leader at the Carletonville Multipurpose Sports Complex. The event started at the gravesite of the late Elijah Barayi at West Wits Cemetery. It was declared to be a Provincial Heritage site by the Premier of Gauteng David Makhura together with the MEC for Sports and Recreation Faith Mazibuko, the Executive Mayor Maphefo Mogale Letsie, the family of Elijah Barayi and the members National Union of Mineworkers (NUM) as well as COSATU. The Executive Mayor opened the doors by welcoming everyone who had come to share this special day with the family, and honour the history behind Elijah Barayi. In her opening speech, Mogale Letsie said, “As we today declare the gravesite of Elijah we are making a mark of the struggles. We as people have been through and are making it a priority for future generations to learn about the history of good leaders who played a role to change the systems in the mining working environment in the apartheid era. This day should be remembered for it goes down as a special history we have in Merafong and we should cherish it and learn from it. Makhura declared the site a Provincial Heritage site and mentioned that from now on the grave of the late Elijah Barayi would be protected and would foresee that security is at site to guard that nothing is damaged at this gravesite as previously the grave got damaged and part of the tombstone got vandalized and part of it got stolen. The event then proceeded to the R501 road to be renamed, the R501 will be officially changed and renamed to Elija Barayi in future in honour of him and to make his mark. A walk about then followed at a mega human settlements project near Welverdiend. The project started in June 2017 and is set to deliver 12 786 houses and plans to develop a school, a clinic and an industrial park in the area are also in progress which will be completed around 2023 to be fully developed. The event commenced to phase 3 where the main event was at the Sports Complex whereby many people awaited to be addressed on the updates of the project and to be given a memorial lecture of the late Elijah Barayi, the former President of South Africa Kgalema Motlanthe arrived at the venue to give a memorial lecture of the struggle icon. Premier David Makhura then awarded a posthumous Special Recognition Award to Ntate Elijah Barayi for his pioneering role in advancing the struggles of workers. The award was accepted by the son and daughter of Ntate Barayi. 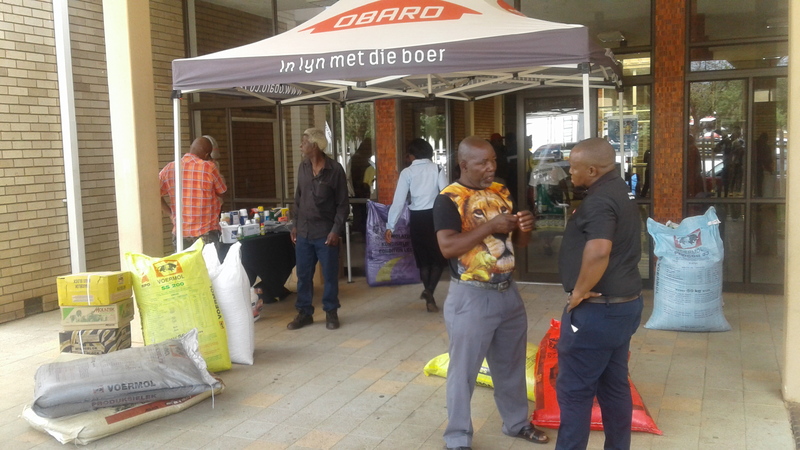 Stock Theft Farmers Day The Department of Agriculture and Rural Development together with Merafong City Local Municipality alongside with Local Economic and Rural Development gathered the farmers of Merafong at Carletonville Civic Centre. The primary purpose of the gathering was to have an open conversation with the local farmers on new technology that has emerged that will assist them in their field, as well as providing with information on how to protect their livestock as a means of reducing stock theft. Galaletsang Hutang from Agricultural Research Council gave an informative talk about the genetic service which is the DNA that the institute offers for the livestock. As a farmer it is important to take sample of your livestock to the council so they may have the DNA sample of your stock and the details of stock owner as a measure of identifying who the livestock belongs to in case of theft. She gave a mention that stock DNA is the same as human DNA as they are found in the blood, bones, hair, skin or teeth. 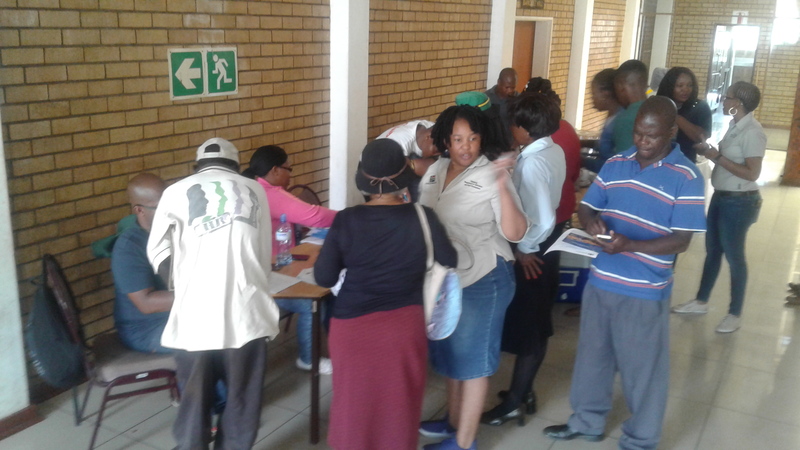 Pranisha Soma from the same institution also said that as from 1st of April 2019, parent identification method is to be implemented in the area of Merafong as a means of identifying to whom the livestock belongs to. Colonel Majingo from South African Police Services (SAPS) addressed the farmers on procedures to follow once your livestock has been stolen; this topic was an indication that farmers are experiencing difficulties of theft in the surrounding town of Merafong, as they expressed their concerns and grievances. She indicated that farmers should know the number of livestock they own by constantly keeping record. If it happens that the livestock is missing immediately farmers should contact the SAPS and the stock theft officials. The stock theft officials will conduct an investigation upon the information you provide to ensure that they locate your stock. If it happens that the stock has been already slaughtered, the stock owner has to open a case against the perpetrators. Hence it is important to keep record of the stock sample through Life Stock Identification Catalogue (Lid CAT). Upon the discussion Ms.Lerato Makganya from the Department of Forestry and Fishery delivered an informative talk about the importance of branding. By branding your livestock you make it easy not just for yourself but for the stock theft officials to be able to correctly identify your stock in terms of theft. She identified several techniques which farmers should use when branding their livestock such as tattooing. It is a marking technique in which a permanent mark is placed in an unobtrusive area such as on the ear of an animal, ear notching is a simple and handy method to identify animals individually from a distance. There is an ascent technique which is still used which is burning, the farmer can brand its livestock by lightly burning it in an area that will be noticed by them. She also indicated the importance of not telling other people where you have marked you livestock, as it is your own secrete location.